Reading and share top 16 famous quotes and sayings about Brave Hearts by famous authors and people. 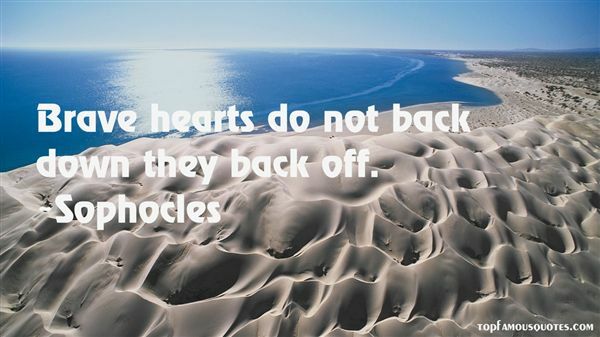 Browse top 16 famous quotes and sayings about Brave Hearts by most favorite authors. 1. "I sought them far and found them, The sure, the straight, the brave, The hearts I lost my own to, The souls I could not save They braced their belts about them, They crossed in ships the sea, They sought and found six feet of ground, And there they died for me." 2. "Courage is a heart word. The root of the word courage is cor - the Latin word for heart. In one of its earliest forms, the word courage meant "To speak one's mind by telling all one's heart." Over time, this definition has changed, and today, we typically associate courage with heroic and brave deeds. But in my opinion, this definition fails to recognize the inner strength and level of commitment required for us to actually speak honestly and openly about who we are and about our experiences -- good and bad. Speaking from our hearts is what I think of as "ordinary courage." 3. "So it is written - but so, too, it is crossed out. You can write it over again. You can make notes in the margins. You can cut out the whole page. You can, and you must, edit and rewrite and reshape and pull out the wrong parts like bones and find just the thing and you can forever, forever, write more and more and more, thicker and longer and clearer. Living is a paragraph, constantly rewritten. It is Grown-Up Magic. Children are heartless; their parents hold them still, squirming and shouting, until a heart can get going in their little lawless wilderness. Teenagers crash their hearts into every hard and thrilling thing to see what will give and what will hold. And Grown-Ups, when they are very good, when they are very lucky, and very brave, and their wishes are sharp as scissors, when they are in the fullness of their strength, use their hearts to start their story over again." 4. "She did not know yet how sometimes people keep parts of themselves hidden and secret, sometimes wicked and unkind parts, but often brave or wild or colorful parts, cunning or powerful or even marvelous, beautiful parts, just locked up away at the bottom of their hearts. They do this because they are afraid of the world and of being stared at, or relied upon to do feats of bravery or boldness. And all of those brave and wild and cunning and marvelous and beautiful parts they hid away and left in the dark to grow strange mushrooms—and yes, sometimes those wicked and unkind parts, too—end up in their shadow." 5. "Live as brave men; and if fortune is adverse, front its blows with brave hearts"
6. "For this is what we do. Put one foot forward and then the other. Lift our eyes to the snarl and smile of the world once more. Think. Act. feel. Add our little consequence to the tides of good and evil that flood and drain the world. Drag our shadowed crosses into the hope of another night. Push our brave hearts into the promise of a new day. With love; the passionate search for truth other than our own. With longing; the pure, ineffable yearning to be saved. For so long as fate keeps waiting, we live on." 7. 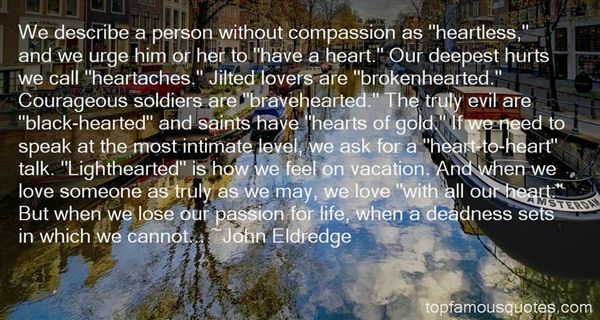 "We describe a person without compassion as "heartless," and we urge him or her to "have a heart." Our deepest hurts we call "heartaches." Jilted lovers are "brokenhearted." Courageous soldiers are "bravehearted." The truly evil are "black-hearted" and saints have "hearts of gold." If we need to speak at the most intimate level, we ask for a "heart-to-heart" talk. "Lighthearted" is how we feel on vacation. And when we love someone as truly as we may, we love "with all our heart." But when we lose our passion for life, when a deadness sets in which we cannot..."
8. "We'll squeeze every second that we can from our lives, because we're young, and we have plenty of years to grow. We'll grow until we're braver. We'll grow until our bones ache and our skin wrinkles and our hair goes white, and until our hearts decide, at last, that it's time to stop." 9. "[I]n America, wrongs can be righted,warriors can wear skirts and blouses,and the bravest heartsmay beat in girlsonly five feet tall." 10. "It's up to brave hearts, sir, to be patient when things are going badly, as well as being happy when they're going well ... For I've heard that what they call fortune is a flighty woman who drinks too much, and, what's more, she's blind, so she can't see what she's doing, and she doesn't know who she's knocking over or who she's raising up." 11. "All that we know, soon shall we abandon. As time will lend itself. Eyes know only what they see. But brave hearts beat on with belief." 12. "Is the beauty of the Whole really enhanced by our agony? And is the Whole really beautiful? And what is beauty? Throughout all his existence man has been striving to hear the music of the spheres, and has seemed to himself once and again to catch some phrase of it, or even a hint of the whole form of it. Yet he can never be sure that he has truly heard it, nor even that there is any such perfect music at all to be heard. Inevitably so, for if it exists, it is not for him in his littleness. But one thing is certain. Man himself, at the very least, is music, a brave theme that makes music also of its vast accompaniment, its matrix of storms and stars. Man himself in his degree is eternally a beauty in the eternal form of things. It is very good to have been man. And so we may go forward together with laughter in our hearts, and peace, thankful for the past, and for our own courage. For we shall make after all a fair conclusion to this brief music that is man." 13. "Men pass in front of our eyes like butterflies, creatures of a brief season. We love them; they are brave, proud, beautiful, clever; and they die almost at once. They die so soon that our hearts are continually wracked with pain." 14. "You are so young, Lyra, too young to understand this, but I shall tell you anyway and you'll understand it later: men pass in front of our eyes like butterflies, creatures of a brief season. We love them; they are brave, proud, beautiful, clever; and they die almost at once. They die so soon that our hearts are continually racked with pain. We bear their children, who are witches if they are female, human if not; and then in the blink of an eye they are gone, felled, slain, lost. Our sons, too. When a little boy is growing, he thinks he is immortal. His mother knows he isn't. Each time becomes more painful, until finally your heart is broken. Perhaps that is when Yambe-Akka comes for you. She is older than the tundra. Perhaps, for her, witches' lives are as brief as men's are to us." 15. "Brave hearts do not back down they back off." 16. "Naturally all of them had a sad story: too much notice, not enough, or the worst kind. 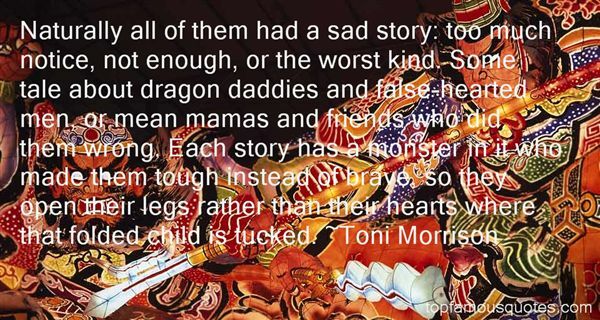 Some tale about dragon daddies and false-hearted men, or mean mamas and friends who did them wrong. Each story has a monster in it who made them tough instead of brave, so they open their legs rather than their hearts where that folded child is tucked." I am a joke toldagain."